A comprehensive article on selecting and building your first scale R/C model airplane from plans. After forty years of building model airplanes one acquires many skills and will take many aspects of hobby building for granted. In the past when I sold a plan I assumed the person who purchased it has the knowledge needed to put the model together with the aide of the construction manual. That, of course, is not always the case. There are often many general aspects of construction not covered in most manuals. Many of my plans, and those by other designers, are purchased by modellers that have not built a model from plans before. Building from plans is a fun and exciting part of the hobby. It allows the builder to construct a model not often seen at the flying field. You are also not constrained by the liability aspects of most large kit manufactures such a size, weight, and construction techniques. Any level of finish from casual fun-fly model to a model used in scale competition is possible. But, it can also be a nightmare for the first time plans builder. In this article we help explain the basic aspects involved in constructing your first plans built model. We won’t be able to cover every subject and surely will miss some aspects, or they may need further explanation. There is a one-stop shop for additional help though. Visit the R/C Scale Builder web site at www.rcscalebuilder.com. If you cannot find help within their “tutorial” and posted “Articles” you can always post your questions and receive help from the many members of this great web site. Let’s start by explaining the difference between building from plans and scratch building. A “scratch builder” does not purchase engineered plans but uses a collection of data, scale drawings, etc. to develop their own outlines of the model to the scale they choose. Or they may just dream up a design and start cutting wood. They rely on their own skills to produce formers, ribs, and other parts to build the model. A scratch builder normally has been doing this long enough to have acquired the knowledge required to produce a structurally sound airframe without outside assistance. A “plans builder” is one that buys plans for a model, then either buys a kit of parts or makes their own parts, to construct the model. Experienced designers engineer most plans offered. Much thought has gone into making certain the airframe is a safe and sound design. Of course, the airframe is only as good as the construction. Care must be taken by a builder to cut the parts to accurate size for a true fit and in using the appropriate adhesives to ensure a tight and secure joining of the parts. If you are going to build from a plan and have not built several kit planes first it will be a good idea to reduce you choices of selection based on degree of construction difficulty involved and flying characteristics of the finished model. A lot of us get into plans building because we what something cool like a P-51 Mustang for instance. That would not be a good choice for a novice kit builder or first time plans builder. Models of that degree of difficulty can pose many problems during construction and are considerably more difficult to fly than other available choices. By the same token, there is no sense plans building a non-scale trainer or Piper CUB. These type models are available in kit form and as ARF’s (Almost Ready to Fly) and will be a more economical choice than plans building. If you do not have field experience in the operation and flying of low-wing aircraft, and multi-engine aircraft they should be avoided for similar reasons. The type of airplane you should be looking for is something with stable flying characteristics. Some of the clues will be a good degree of wing dihedral, positive wing root incidence accompanied by wing washout, and engine down thrust. Confused? Don’t worry; this is not going to be a course in aerodynamics. The majority of plans designers have taken all these factors into account when designing the model. We are just going to give you and idea of some of the things to look for, and an explanation of the terms involved. If you are looking into building a high-wing cabin plane you have little to concern yourself with. Most of these factors are incorporated in their design simply due to the dynamics of the layout. If you are thinking about building a low-wing model then you will want to consider these items. The following is a general explanation of some terms you will encounter and how they apply to you at this point. Datum: With regard to model plans and aircraft scale drawings, the datum, or datum line, is the line used to establish the level attitude of the airplane. Often it will be a line drawn the centre of the propeller to the tail of the airplane. We will assume the airplane is level with the datum line when discussing the following terms. Wing Dihedral: Look at an airplane from the front view. If the wings are level with the ground surface (most are not), then it has no dihedral. If the wing panels are angled up from the fuselage to each wing tip, then it has dihedral. If the wings are angled down from the fuselage to the wing tips, it has anhedral – stay away from those for the time being. Generally, the more wing dihedral, the more stable the model will be in flight. Angle of Incidence: Look at the airplane in side view where the wing meets the fuselage (wing root). If the front of the wing is angled upward, it has positive wing incidence. If the front of the wing is angled down, it has negative wing incidence. We want positive incidence in our model – somewhere between 1-1/2 to 2-1/2 degrees is the norm. Washout: This is the difference between the incidence of the wing root and the wing tip in a positive manner. If you have 2-1/2 degrees of positive incidence at the wing root and zero degrees incidence at the wing tip, you have 2-1/2 degrees of washout. Washout is incorporated into a wing to help prevent wing tip stall. Imagine you model during landing approach. You have lined it up with the runway and reduced the speed in anticipation of a smooth touch down. As you begin to flare out for touchdown, the nose of the model comes up. 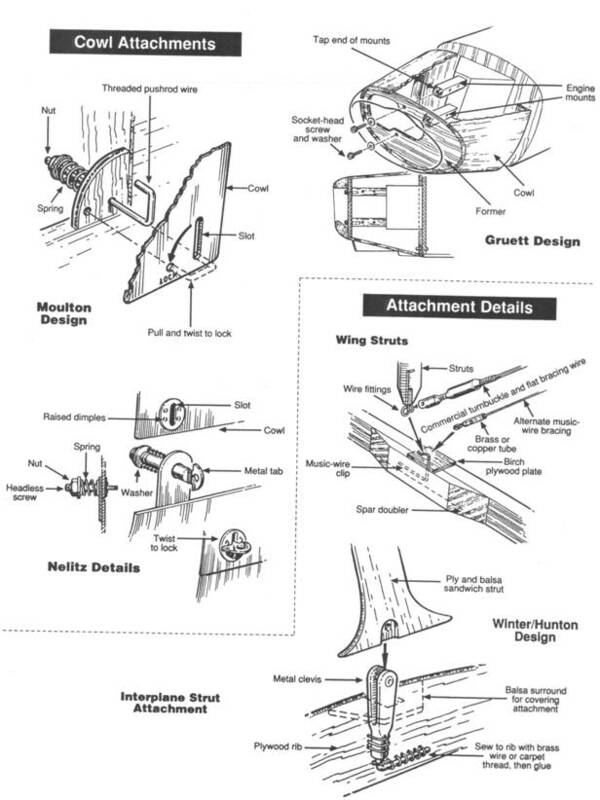 The positive incidence of the wing increases to the point that the wing root area stalls, or no longer provides lift, and the model looses altitude. That is a good attribute during the landing mode. The wing washout will allow the wing tips, and much of the outer wing panels, to continue to provide lift thus allowing you to maintain control of the model until touchdown. If you did not have wing washout, the entire wing would stall. What normally occurs without washout is one wing panel stalls before the other (tip stall) and the model falls off to that side and crashes, or spins into the ground. Down Thrust: Down thrust is the negative angle between the engine centerline and the datum line. Down thrust is often used to maintain level flight of a model with a high-lift wing across the range on engine power settings from low speed to high speed. Down thrust is normally incorporated into high wing cabin models that use “flat bottom” or high-lift airfoils. Without down thrust, the model would climb while trying to maintain level flight at a faster rate the faster it was going. Down thrust can also have a positive effect on models during landings. Using the landing scenario in the washout definition above, suppose you need to increase speed just before touch down. If you applied power without engine down thrust the model would jump skyward. That would further increase wing incidence during that low-speed condition making the entire wing stall out and causing loss of control of the model. Engine down thrust would allow the model to move forward and help you maintain control. Airfoils: An airfoil is the shape of the wing in cross section. Much like the wing rib. The shape of the airfoil and the wing attitude in relation to its forward movement (incidence) at speed is what generates the lift for the model. There are literally thousands of differently shaped airfoils. We will only be discussing four generic types as used for our models. Of course, there are hundreds of different shapes within these types but we are concerned just with the general flight characteristics of each. In discussing airfoils you will need to be made aware of another term in order to explain how they work. Mean aerodynamic chord, or MAD is simply a line drawn from the center of the leading edge of the airfoil to the center of the trailing edge of the airfoil. We will just call it the “chord line”. Under Chambered Airfoils: This type of airfoil is considered a very high lift airfoil and used for slow flying aircraft. It is curved upward on the top surface and on the bottom surface. These types of airfoils were most generally used on early pioneering airplanes and World War One aircraft. Models using this type airfoil are usually a bit difficult to build and require a lot of attention to details and relationships between wing(s) incidence(s), datum lines, and thrust lines. Flat Bottomed Airfoils: This type of airfoil is curved upwards on the top surface and is flat, or a straight line, on the bottom surface. Most are not actually flat along the entire length on the bottom surface. Generally the front portion of the lower leading edge curves upward to meet the curve of the top surface. These can be classified as high-lift airfoils and are used on aircraft of moderate speed capabilities. The most notable of these is the Clark “Y” airfoil as used on the Piper CUB and many other general aviation airplanes. Usually the flat portion of the lower wing surface is in alignment with the datum line of the airplane where the wing meets the fuselage. That installation provides positive incidence because the leading edge of the chord line will be angled upward in relationship to the datum line. The wing should have washout at the tip to equal that angle in order to maintain good flight characteristics. Models built using this airfoil are most often the easiest to build and fly. Semi-Symmetrical Airfoils: These airfoils are curved upward on the top surface and curved downward (to a lesser degree) on the bottom surface. We will call these general airfoils or high-speed airfoils. Most of the military and commercial aircraft used this type airfoil. They are normally installed with positive incidence at the root rib and have washout in the wings. Some civil aircraft from the “golden era” use these airfoils including the Taylorcraft, Aeronca, and Interstate Cadet. Most modern civil aircraft use it as well. With the exception of the “golden era” aircraft, most models built using this airfoil will require a higher degree of building and flying skill. Most will have retractable landing gear, flaps and other operating features not found on entry-level models. Fully Symmetrical Airfoils: These airfoils are curved on the top surfaces and the bottom surfaces to the same degree. They provide no lift when the chord line in parallel to the datum line. These airfoils a generally used for stabilizer/elevators, and fin/rudders of scale models. Well, now you may think we have limited your choices to trainers or CUB’s. Not so. If your liking is for civil aviation aircraft your choices are many. There is even a couple of low-wing aircraft for you to consider. One is the Ercoupe. The Ercoupe makes a good flying model with good ground handling characteristics as well. High-wing cabins planes from the golden-age to the present make very good choices. Don’t worry about whether the airplane has tricycle landing gear or is a tail-dragger. There really is little advantage or disadvantage of either type model at this point. Your choices are a bit more limited on the “warbird” scene. Don’t think that because the full size airplane was a trainer the model will be a good choice. Most of the single-engined primary and advanced trainers built during WWII for the American services were much more difficult to fly than the fighters the pilots graduated to. That was done for a purpose – to washout the pilots that didn’t have the skills to perform the required additional workload when piloting front line aircraft. Similarly, an AT-6 Texan, or at PT-19 Kadet does not make a good first time model. I would suggest building a model of an aircraft used for Liaison duties like the Taylorcraft L-2, Aeronca L-3, Piper L-4, Stinson L-5 and the Interstate L-6 instead. On the other hand, trainers built for service in the United Kingdom often make great first time models. Their logic was that the pilot would advance from one plane to the next as their skills were acquired. They also did not have the population to afford early washouts. Two of the best UK trainers are the DeHavilland Tiger Moth and the DeHavilland Moth Minor. The Moth Minor is a low-wing, open cockpit, tail dragger. The Tiger Moth is an open cockpit, bi-plane, tail dragger. Both models fly and handle extremely well. I would suggest the Moth Minor over the Tiger Moth because it is much easier to build. If you have some low-wing flying experience, there are several single-engined military aircraft I can recommend. Many plans designers offer “short kits” and “full wood kits” for their plans. These items may be available from the designer or from a designated Kit Cutter. Some designers and accessory manufacturers offer items such as fiberglass fuselages and foam wings for the plan. A short kit consists of all the parts that require cutting out such as the ribs and formers and other parts detailed on the plans. The builder furnishes the needed stick wood for stringers, spars, etc. and the sheet wood for covering the fuselage and wings. A full wood kit comes with all the wood materials required for construction. In either case, the builder normally buys the hardware needed for completion. Other items of interest designed specifically for many plans are fiberglass, resin cast, and vacuum formed parts such as cowlings, canopies, exhaust stacks, cockpit interiors, and other small parts to help detail a model to your desired level of completion. These items will be available from the plans designer or an accessory manufacturer and may be noted on the plans or in a construction manual. First thing to do after buying a power tool is to read all the literature provided before setting it up and turning it on. It is much better to be bored with the details than to take a trip to the emergency room. Safety first – fun later! Most of us already have an electric drill so we won’t take any time with that item. The electric scroll saw is one of the hobby’s most valuable tools and is a “must have” for any level above ARF’s. There are several quality scroll saws on the market. Perhaps the most note worthy are the Dremel products. Check out the Lowe’s or Home Depot stores for this and other manufacturers. You will be using the scroll saw to cut out all your major parts like ribs and formers. Look for a saw with a minimum 12” distance from the back of the blade to the neck – more is better. Some scroll saws include a small circular sander attached to the side. These sanders are good for small parts but are not quit large enough for items like ribs and large formers. The combination belt and disc sander will be used to smooth out the parts you cut with the scroll saw. The same stores mentioned above will be your first stop for shopping this tool. Look for a tool with a 4” wide belt and a 6” diameter disc. We will get into its use a little later. Another handy tool is the hand held rotary tool. They are available with a myriad of attachments and bits. My two favorites are the carbide ball and drum sanders and the large diameter fiber reinforced cut-off wheels produced by Robart and available from Tower Hobbies. 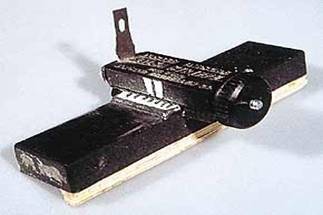 The carbide sanders are great for hollowing out balsa blocks and trimming the insides of the fuselage formers to reduce weight of the model. The cut-off wheel is great for cutting music wire and trimming hard to reach parts. You will find so many other uses for it you won’t know how you did without it. My two favorite brands are Dremel and Ryobi. Check the above mentioned stores for pricing and availability. After you have been building form plans for a while you will want to acquire a band saw. A 9” tabletop two-wheel unit will be just fine for our type of work. Don’t bother with a discount priced 3-wheel unit. The wheels of a 3-whell unit are too small and exert too much force on the thin blades. They have a habit of breaking very easily and always in the middle of a cut. You will be using the band saw for you’re outside cuts and the scroll saw for your inside cuts. Check the above-mentioned stores and Sears for several good band saws in the $100 price range. There are several hand tools that you will need when cutting out and constructing of your model. The most common among these is the “hobby knife” or Xacto knife. You will need what is called a #1 handle and #11 blades. Tower Hobbies has a great selection from the basic knife to a 3-knife set to fit the full range of available blades. Remember – like all knives, never cut toward your self. If you are cutting against a straight edge – use a metal straight edge and keep your fingers well away from the cutting edge. Another important tip when using the hobby knife is to replace the blades often. Pressing down with a dull blade and dragging it through the wood is an open invitation to disaster. Okay, a couple of other safety tips: if you drop the knife, back away from the table quickly – never try to catch it. These knives have an uncanny way of hiding under things on the work- table and rolling off the table to stick in your foot. To alleviate the problem I put a pencil eraser cap on the end of the knife. You know, like the ones you would buy to put on the end of a pencil. Other important items are sanding blocks and sanding paper. You can make your sanding blocks from various sizes of 1”x3” and 2”x4” wood and cover them with sanding papers cut to suit. A better method is to have an assortment of the aluminum sanding bars available from Tower Hobbies. They also sell sticky-back sanding papers to fit. A couple of metal straight edges for cutting straight lines with your hobby knife will be a big aide as well. I like to have a 12” and 18” long one available. Most office supply stores sell cork backed stainless steel rulers that are perfect for this use. Again, keep your fingertips back from the cutting edge when in use. A builder just cannot have enough clamps to hold things together. There are numerous kinds and sizes of clamps available in hardware stores. You may wish to purchase these at a later date but for know let me suggest some more economical solutions. You will find that wooden close pins can be used for areas of model construction. Also, a collection of various sizes of rubber bands will be useful. Another item you can’t have too many of is pins. Regular straight pins will work fine but “T” pins sold by hobby suppliers have the advantages of being easier to push in place and remove after use. A box of each of the three sizes offered by Hobbico and available from Tower Hobbies should do the job. You will need a work area to build your model. Most important will be a table or bench where you can leave your project laid out during construction. This can be anything from a custom-built workbench to a folding table. Your work surface must be smooth, flat, and warp free or you will build these misalignments into your model. A simple workbench can be made from a 36” wide, flush face, solid core, wood door. You can support it with sawhorses or a frame and legs fabricated from 2x4’s. Give the surface several coats of polyurethane paint to make clean-ups easier. You will need to prepare the surface so you can pin to it. I found a sheet of 1/2”x4’x8’ sound deadening board (Hushboard by Georgia-Pacific) at the local building supply store that has worked great. Cut it to the size of your worktable and hold it in place with small finishing nails on about 12” centers around the perimeter. I painted the surface of mine with a couple of coats of white exterior latex house paint. Lay your plans on the work surface and hold them in place with thumbtack at the corners. You should cover your plans with something transparent that glue will not stick to. The old method was to use waxed paper. Unfortunately, the new waxed papers are no longer very resistant to the glues we use. A better material is the clear plastic paint drop clothes available drop hardware stores. There are literally hundreds of various adhesives on the market. It can be very confusing trying to find the right product for use in modeling. We require adhesives that are both strong and light. Most adhesives for household use are not appropriate for model construction. To be on the safe side it is best to purchase them from a hobby shop or hobby supply house. Even at that, there are still many choices to make. To avoid some of the confusion, we will use just three types of adhesives, and only one kind of each for this article. Once you become familiar with the benefits and drawbacks of the available alternatives you can use your judgment in selecting your favorites. The adhesives mentioned below are available from Tower Hobbies. Epoxy – We will be using a two-part epoxy adhesive for those areas that require a very structurally sound joining of parts like the firewall. We will be using what is called 30-minute epoxy. It will provide sufficient working time to allow the parts to be aligned and clamped in place before setup. Choice – Pacer Z-Poxy 30-Minute 8 oz. Cyanoacrylate – Generically called “super glue” or “CA” glue, this will be our primary construction adhesive. CA is available in several viscosities but we will be using what is termed as “medium” or gap-filling CA. Choice – Pacer Zap-A-Gap CA+ 2 oz. Aliphatic Resin – This glue is generically known as “white glue” but the glues provided by the hobby supplier have additional characteristics for greater strength and are lighter and easy to sand. We will be using this adhesive for joining sheets of balsa and planking to the airframe. Choice – Great Planes Pro Wood Glue 4 oz. Spray adhesive – You will be using this product to attach portions of you plans to the wood and pieces of wood together temporarily to cut out the parts for you model. My favorite is 3M 75 Repositionalbe Adhesive. Solvent – A general solvent for use in cleanup of epoxy, CA, and the spray adhesive is acetone. It is available from Lowe’s or Home Depot. Aliphatic resin can be cleaned up with a damp cloth before it dries. Safety precautions should be taken when using any of the previously mentioned products. If you experience a physical reaction to any of them you should discontinue there use immediately. If you have a reaction from using CA or epoxies you can substitute aliphatic resin glues. For areas requiring a stronger joint I would use high-strength aliphatic resin glue. Just be sure to clamp the parts together like in the firewall areas to ensure a secure joint. I would suggest using Titebond III Ultimate Wood Glue in these areas. Materials for filling voids and making fillets for you model are available in several types and used for various applications. Some of these fillers have structural characteristics and others are used to provide a smooth surface in preparation for priming and painting the model. During construction your model will receive “hanger rash”. That is a term used to describe the dents and dings the airframe receives in the shop (hanger). Simply dampening the dent with water and applying heat to the dent with an iron can remove most hanger rash. Set the iron on high or “cotton”. The steam produce by the application of the iron will raise the wood fibers and remove most dents. Follow up by sanding the repair lightly with a sanding block to bring it level with the surrounding area. If the wood fibers in the dented area have been broken (these are called “gouges”) you will not be able to completely remove the dent with this process and it will need to be filled and sanded. To repair gouges and voids in the airframe I recommend a lightweight filler-putty like Hobbico HobbyLite Balsa Coloured Filler available from Tower Hobbies. The same product may be used to fill voids in strip-planked areas also. The product is also good for making small fillets like where the fin and stabilizer meet with the fuselage. Use this, or a similar product, for all general repair work on the airframe prior to priming and painting. Structural fillers are used in areas to fill voids and produce fillets to increase strength of a joint. Some of the areas can be around the firewall of in the areas for retract installation. A mixture of epoxy and a special filler compound may be used. I recommend Great Planes Milled Fiberglass or Prather Micro Balloons mixed with 30-minute epoxy for this application. A great filler for things such a wing fillets and large fillets for the fin and stabilizer is lightweight automotive body putty. Stay away from the products sold in hardware stores. These are normally general-purpose fillers and are very heavy and hard to sand. The best product I have found is Evercoat Rage Gold. It is very light and sands almost as easily a balsa. Check with an automotive paint store for availability. Use this product on your model after you have glassed it and before the first application of primer. I like to use acrylic lacquer primer on my models. It is light and sands very easily. My favorite is DuPount 30S gray primer available from automotive paint stores. This primer is compatible with the widest range of finishes for your model including, dope, lacquer, urethane, enamel, and epoxy. Do not use the spray can primers found in hardware stores and do not use enamel-based primers. I use a compressor and spray gun for application. Most automobile paint stores have the acrylic lacquer primer in spray cans. After you have primed and sanded you model for the first time you will inevitably find some low spots. If you have primed with automotive acrylic lacquer primer so you can use lacquer based non-shrinking spot repair putty for these areas. They are also available from automotive paint stores. There are a lot of sophisticated methods used by professionals to cutout these parts. Some shops make templates of the parts for reuse so they can make parts in the future. Some of the methods used include hand held and CNC routers, special equipment for cutting notches and other repetitive cuts, and laser cutting. We are going to discuss basic methods for use in the home workshop. This is going to sound like a lot of work but actually it is not. It just takes a lot of words to describe the processes involved. These processes will become more like a fluid motion after you get the hang of them. 1. The first to do is cut out the parts from the plans with a pair of scissors. If you do not wish to cut out your plans then have a Zerox copy made of these parts. Stay about 1/8” outside of the part outline when cutting them out. Do not cut out the holes inside the parts or the notches in the parts for stringers, etc. Use a felt tip pen to make certain the part numbers are on the paper parts. Place all the paper parts in a container like a shoebox so they don’t get misplaced. 2. Now we will affix the paper patterns to the wood. Let’s start with the balsa wood ribs. We will assume the ribs are 3/32” thick balsa and the wing requires two of each rib. Lay out the patterns on a sheet of 3/32”x3”x36” balsa. For large models you may need 4” wide by 48” long balsa to get the parts to fit. You even may need several sheets of balsa for all the ribs. Shuffle the patterns around until you get as many to fit on the wood as you can with little waste. Keep a minimum of ¼” between each part. After establishing the layout you can affix the patterns to the wood with the 3M 75 adhesive. Never use 3M 77 adhesive for this process as you may not get the patterns and stacked wood apart. Spray a medium coat of adhesive on the back of the pattern and apply to the wood surface. 3. Affix another sheet of balsa to the back of the one with the rib patterns. Apply a light coat of 3M 75 adhesive to the face of each sheet of balsa. Wait about one 30 seconds, then, stack the balsa sheets, adhesive face to adhesive face, together. Lay the sheets on a smooth, flat surface, and apply medium pressure to them to ensure they are firmly stuck together. Use a piece of 2x4 to do this. Do not press too hard or you will distort the soft wood. 4. If you are doing a straight-wing model like a CUB where you will need multiple ribs of the same size you can cut the balsa sheet to the required length and stack them for multiple cutting. Do not cut more than 6 ribs at one time. Make several copies of the pattern and cut several stacks of ribs. The reason for doing this is due to the equipment we are using. The scroll saw blade is very small and flexible. As the stack of wood gets get taller, it will become more difficult to cut a stack where all ribs are the same size. 5. Cut the individual parts out of the sheet. You may need to separate the parts into smaller groups or individual ribs that will fit the size of you scroll saw. Use your Xacto knife for this. Drill a ¼” diameter hole thru the part in the center of the area(s) that need to be removed like lightening holes, etc. Drill slowly with a sharp bit to avoid making a mess of the part. Place a piece of pine wood beneath the part and press the part firmly against the wood when drilling. A brad point bit is best for this job. Clean up the areas around the holes after drilling to maintain a smooth surface where the part is to be placed on the scroll saw table. 6. Next job is to cut out the areas to be removed inside of the individual parts. Remove the upper end of the scroll saw blade and slip the part over the blade, through the drilled hole, pattern side up. Reconnect the blade and you are ready to cut out that area. Cut slowly from the hole towards the line on the pattern then follow the line all the way around. You may need to cut the area out in sections to avoid interference with the scroll saw neck. Remove the part and cut out the remaining internal areas in a similar manner. 7. Next we will cut around the external part lines. You do not need to stay very close to the outline. I like to stay from 1/32” to 1/16” toward the outside of the outline. Don’t cut out the notches in the parts yet either. 8. Now we have all the ribs cut out. Next job is to sand them to shape. We will use the 6” disc sander for this. Make sure the sanding table and the disc sander are 90 degrees to one another. Place the stacked ribs on the sanding table and slowly sand them to the edge of the lines on the pattern. This makes for a much smoother part than can be cut on the scroll saw. 9. Next we go back to the scroll saw and cut out the notches in the perimeter of the rib pattern outline. Carefully make plunge cuts on each side of the notch. You can remove the remaining wood in the notch by making a few plunge cuts between the first two and using the scroll saw blade like a sander by moving the part back and forth until you have cleaned it up to the bottom of the notch. Check the cut out notch for fit with the intended size spar or stinger. 10. Peel the pattern of the part, and separate the parts. Mark the parts with the numbers shown on the plans and place them in a box to keep them all together. 11. Fuselage formers are cut out using the same method used for the ribs. Cutting the plywood parts will require use of a blade designed for plywood and hardwood. Try to cut close to the outline of the aircraft ply or birch ply parts to keep the amount of sanding needed to bring the part to finished outline to a minimum. A small square or draftsman angle template can be use to check parts like the firewall for accurate 90 degree corners. Your level of skills will increase rapidly during this process of cutting out the parts. You will develop methods and shortcuts to make this work faster and easier. You will become familiar with the use of the tools, there advantages and draw backs for accomplishing certain tasks, and how additional tools can help in making the tasks easier. You now have the hard work out of the way so we will move on the lighter subjects. Part 8 - BUILDING YOUR MODEL. I think I have developed a method for maintaining ones enthusiasm from start to finish of a plans building project. It just may work for you. We are normally full of vim and vigor at the time of plans purchase but, often run out of drive along the way and sometimes don’t even finish the project. Most of us start with the fuselage, as that is usually the most action oriented part of the airplane and the portion that gave it the character that attracted you to it in the first place. Here we normally cut and assemble as we go. The problem with this method is, the deeper into the project we get, the more difficult and boring it may become. This results in a loss of enthusiasm for the project and often the model is not completed. A visit to your friend’s workshops will confirm this. Notice all the half completed projects. You will see mostly framed-up fuselages and no wings. Look in my shop and you will find several projects that have been gathering dust for years. The builders ran out of enthusiasm. My solution - do the hard parts first. Hear me out; it’s not that bad. Begin by making a complete kit of your project. Cut out and label all plywood and balsa parts. Keep the small parts in Zip-Lock plastic bags and put everything in an old kit box. Don’t leave any thing out. 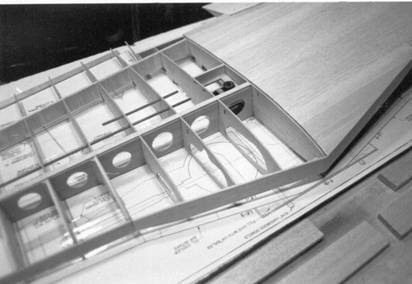 Look carefully; include the aileron, rudder, and elevator center sheets, wing saddles, large fillets, etc. You will note that spruce is called for in places. Spruce has become very difficult to come by lately and most builders are substituting basswood. I still prefer spruce. It can be found but prepare to pay a premium for it. Don’t start gluing just yet. Build all hardware for the project like the tailwheel assembly, control horns, etc. Collect the commercially available hardware needed like control horns, hinges, nuts and bolts, etc. Purchase the cowl, canopy and other accessories you need to detail your model to the extent you desire. Your engine of choice should also be procured by this time. Now would be a good time to get the retracts and wheels as well. Drill the formers and install blind nuts as required to accept the engine, retracts, and tail wheel assemblies at this time. Now, stand back and have a look at what you have put together. That is quite an impressive kit, an accomplishment to be proud of. It was a good deal of work to get to this point and your level of enthusiasm may have dropped a bit by now. Invite your friends over for a look at what you have accomplished. It won’t take long for the pride of your achievement to rekindle your desire to finish the project. Another major plus for you at this juncture is that you now have intimate knowledge of the inner workings of the model and the fit and relationship of the parts. While they are often the single largest expense of a model airframe, with the possible exception of the engine, retractable landing gear is the one operating feature that adds the most character to a model. They can also be the one feature that improves the flying characteristics of a model the most. 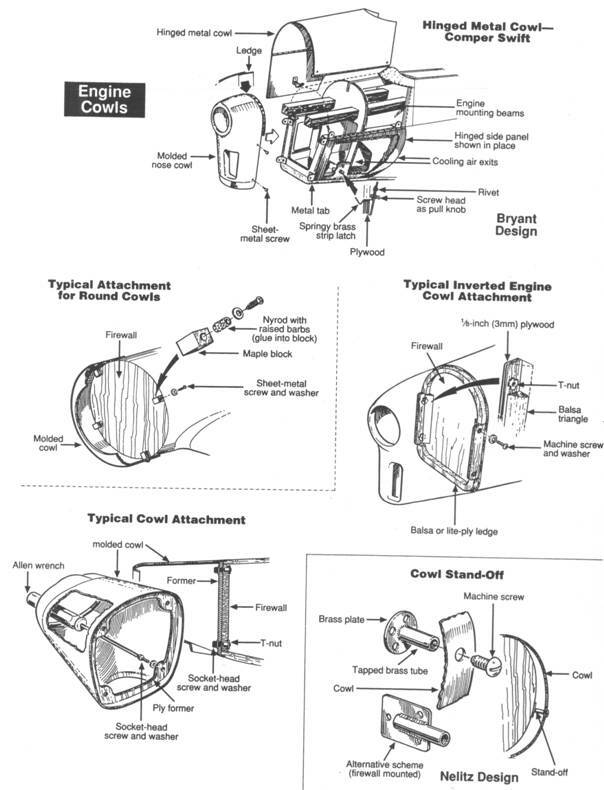 The thought of installation and operation of retractable gear is often viewed as such daunting thing to tackle for a novice that they may put off building a model with them for years. This may well be a new area and require a learning curve before you can feel comfortable with them but it is truly not as difficult as you may think. Most plans designers have retractable and fixed gear specifically designed for their plans. The plans will be designed for installation of the gear as well. That alone should remove most of the fear a novice builder may have for using them. The gear will either be available directly from the plans designer or through manufacturers noted on the plans or in the construction manual. Most will include directions for installation and operation. The wheels required for the plans are often noted on the drawings and available form several manufacturers and hobby suppliers. These items, as noted, have been constructed and tested for the plan and are the preferred items to complete the model. 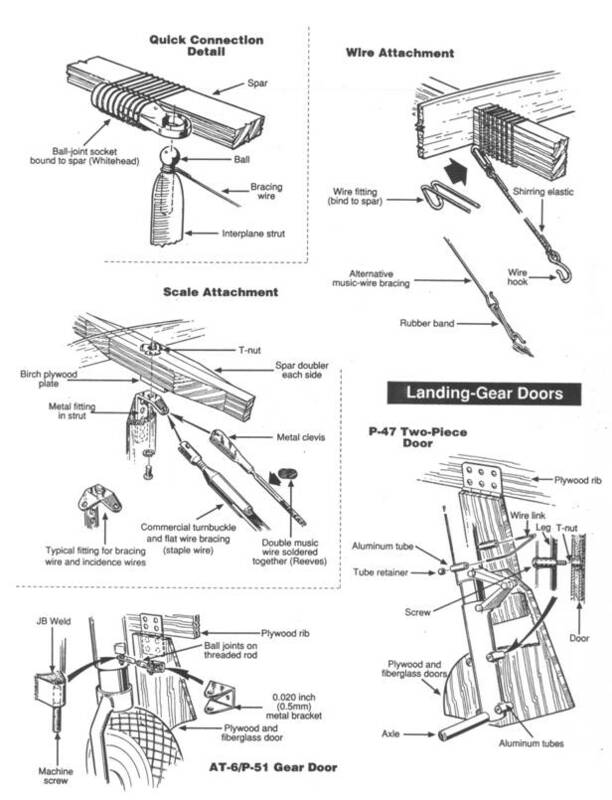 The majority of retractable landing dear manufactured for scale aircraft are pneumatic types. That means they operate by compressed air stored in a pressure vessel within the model. Air lines are routed to the individual gear to power pneumatic cylinders for retract and extension. A small control valve is installed in the air lines and is operated by servo to signal operation of the system. Some gear are furnished with the pressure vessel, air lines, and control valve. Other manufacturers offer them separately. Other choices are gear operated by electric motors, and mechanically operated gear connected to a servo by pushrod. Another method is the hydraulically operated gear systems. They are similar to the pneumatic arrangement but utilize hydraulic fluid instead of air as a motive fluid. Hydraulic leaks inside the model can cause serious damage to the airframe so these units are not often used. Like everything else in this hobby, there is more than one way to do everything. Again, we are going to stick to the tried and true basics. The first thing we need to do is learn how to edge glue individual sheets of balsa together in order to produce one large sheet to cover an area the size of a wing panel. Of course, you would use the same method wherever a large area needs to be balsa sheeted. The three basic grain types of balsa are classified as “A”, “B”, and “C”. A-grain sheet balsa has long fibers that show up as long grain lines in the surface of the wood. It is very flexible cross the grain and bends around curves easily. You normally use A-grain balsa to cover round fuselages, and the sharp curved areas of some wing leading edges. A-grain balsa if normally soft and should not be used in areas where high strength is required or to span large unsupported areas. You may consider using A-grain balsa to sheet fins, stabilizers, elevators, and rudders to keep the tail-weight of the model to a minimum. B-grain sheet balsa has some of the qualities of A-grain and C-grain balsa. The grain lines are shorter than those of A-grain balsa and it is stiffer across the grain than A-grain balsa. B-grain sheet balsa is normally used for general sheeting of flat and gently curving surfaces likes wings, stabilizers, fins, and fuselages. The surface of C-grain sheet balsa has a molted appearance. It is sometimes called “quarter grain” balsa. It is very stiff across the grain and splits easily when conforming to a curve during application. C-grain balsa is very strong and the most warp resistant. C-grain balsa is normally used for wing ribs and fuselage formers. The first thing we need to do is make the edges of the sheet true and square before joining them. I use a piece of lightweight metal angle with medium weight sand paper attached to it. Use a piece of 2-1/2”x2-1/2”x1/8” steel angle five feet long available from your hardware store. Cut 2-1/2 inch strips of 100 grit sand paper and fasten them to one inside face of the angle with 3M-spray adhesive. Coat the face of the angle and the back of the paper and apply the paper to achieve one long sand paper covered surface. Fasten the angle to the underside of your worktable with some C-clamps at each end so the sand paper projects above the edge of the work surface. I have used a five foot long sanding angle to accommodate 48” long sheeting. If your sheeting is limited to 36” long then a 48” long sanding angle will be more appropriate. Place a piece of balsa sheet on the work surface and push the long edge up to the sanding edge. Lightly move the wood sheeting back and forth until you have a smooth, gap free, straight edge. Do this to all the wood sheeting edges you will be gluing together. Select the best side of the wood and place the sheets good face down on the building surface. Join the edges and check for gaps. You may need to smooth-up some edges again on the sanding angle to get a good gap-free fit. Clean all the dust from the wood with compressed air, a dusting brush, or slightly damp cloth. Now we will join the sheets together with 3/4” wide masking tape. Push the joints tightly together and run a strip of masking tape down the full length of each joint. After you have the panel taped together, gently turn it over and lay it flat on the building surface. Now we are ready to glue the joints together. We will be using aliphatic resin glue (white glue, wood glue). We will need to elevate the sheeting from the building surface beneath the joint we are going to glue. Place an object such as a clothespin under each end of the joint. Run a small bead of glue down the entire length of the open joint then remove the clothespins. Press the glued wood joint down on the building and remove the excess glue with a damp cloth. Do each joint until you have completed the panel. I like to apply pressure the panel to ensure a true and flat panel. I use several pieces of 2x4 placed on approximately 6” centers on the panel 90 degrees to the joints. You can them place objects on the 2x4’s to weight them down. Don’t use too much weight, as you will deform the wood. Place waxed paper between the 2x4’s and the panel to keep them from sticking to any glue forced from the joints during this operation. Leave everything in place for about 12 hours so the glue will have time to dry. Next process is to remove the weights and turn the panel over. Remove the tape and sand the panel smooth and flat. Use a sanding block with 100 grit sand papers and finish with 150 grit paper. You will need to all the sanding of the panel while the panel is on the building surface. Do not attempt to sand the panel after it is attached to the model structure. To do so will result in what is called “staved horse” or “oil canning” of the panel. The panel will flex between the ribs or formers causing it to be sanded thinner at the attachment points. After covering and finishing you will see a rippled surface. Here is a method I use when applying balsa sheeting to tapered wing panels in order to avoid warps. The idea is to create a balsa sheet panel with the leading edge and trailing edge sheeting grain matching the wing taper. Draw the trailing edge and leading edge of the wing on the panel. Then draw a line 2-1/2” parallel to and forward of the trailing edge on the panel. Cut the panel sheeting along this line and glue a 3” wide balsa sheet to the trailing edge of the panel. Do the leading edge in a similar manner. For the leading edge you draw a line on the panel at the center of the forward spar so that joint will have the backing of the front spar. Cut the wing panel at this point and glue a tapered sheet to the panel that will have the grain parallel to the leading edge. Make sure the finished panel is about 1/2” to 3/4” larger than the plan view of the wing. As I said previously, we will be using tried and true methods for accomplishing this task. There are faster ways of doing this job like the use cyanoacrylate adhesives specifically made for this task. You may wish to try that method in order to avoid all the pins we are going to use. Just make certain you follow the manufacturer’s written procedures. There is one method I would not recommend though and that is contact adhesives. Besides being very heavy the primary draw back to their use is that if you make one small mistake you will have a warped wing. In this example, we will be sheeting the top surface of a wing panel. We will be using aliphatic resin wood glue and pins to hold the panel in place while drying. Do not cover a wing panel unless it is firmly pinned to the work surface. The result from doing so will be a built-in wing warp. I place a 24”x48” sheet of ceiling tile on my building surface to give me something to pin to. Use a long sanding block in a chord-wise motion to bring all the ribs to smooth alignment. Dust off the structure. I like to apply a mark on each end of the wing sheeting to help align it with the main spar of the wing structure. Apply a bead of wood glue to all the surfaces that will come in contact with the wing sheeting, from the main spar, towards the trailing edge of the wing. Place the sheeting on top of the wing structure and align the marks with the spar. Start by pinning the sheeting to the main spar. Press the wood panel to the spar and place the pins on 1/2” centers. Work the wood panel from the center toward the trailing edge and to the ends. Pin the wood panel to each rib and the other spars at 1/2” intervals. Pin the wing leading edge sheeting in place last. That portion of the wing is normally the strongest part of the wing framing. Having the rear portion of the wing sheeting pinned in place first will strengthen the assembly and make it less likely the wing will warp when pressing the sheeting into the sharp curve of the leading edge. Dampen the top surface of the leading edge sheeting to make it easier to pull in place. Spray Windex is ideal for this purpose (a mixture of ammonia and water). Place a bead of wood glue on the wing structure surfaces that will come in contact with the sheeting. To do this, attach a short length of tubing, like fuel tubing, to the spout of the glue bottle. Reach under the sheeting with the tubing and apply the glue. Press the sheeting in place, again working from the center towards the ends, and pin in place like previously done. Let the assembly set over night to dry. Remove the pins by twisting them and pulling them out. You can now remove the assembly from the work surface. You will not be able to access all the pins you used to pin the wing structure to the work surface but don’t worry about this. Gently pull the structure of the work surface a little at a time by pulling on areas around the perimeter until it comes loose. Turn the wing over and remove the pins. You can now complete the internal wing construction and sheet the lower half. PART 11 - TIPS ON STRIP PLANKING. Oh no! Not strip planking! I know, time consuming, tedious, messy and inaccurate. Well, let’s try to take most of the work out of this process. The real key to making strip planking a much easier task is the method used to strip the balsa wood into accurate, beveled planking and the adhesives used. Cutting accurate strips is best done using a modified balsa-stripping tool. The Master Airscrew balsa stripper is idea for this job. Glue a piece of 1/4” square hardwood to the long edge opposite the cutting blade as shown in the photo below. Adjust the blade so it just touches the work surface. Adjust to cut strips about 3/8” wide. Wider strips will not develop the shape required of the finished piece. Your first cut will not be used but will be waste. Flip the 180 degrees (end for end) making the following cut on the same edge as the previous cut. Do not turn the sheet over between cuts or the planking will be trapezoidal and thus useless. Strip as many sheets required to cover the area to be planked. the two a close as possible. Very little filler material will be required when finished. My favorite method of installing each piece is to place a bead of aliphatic resin (white glue) adhesive along the edge to come in contact with previous sheeting. Then put medium viscosity cyanoacrylate adhesive on those parts of the airframe that will come in contact with the new strip plank. Place the strip in place, pressing firmly into the edge of the previous plank or sheet. Wipe excess white glue from the surface with a damp paper towel. Continue application alternating from side to side, until complete. Cut each piece where it meets the centerline stringer. After each pass of the stripper, turn the main balsa sheet 180 degrees (do not turn it over). This will result in shape “A”. The first cut of the main sheet will look like “B”. Use a plank with cut “B”: where a flat surface meets a rounded one. All succeeding cuts will look like “A”. Be careful not to cut a parallelogram like ‘C’: this plank is useless for precision planking. Upon completion, rough sand the planked areas to shape. Blow-off the sanding dust and apply a lightweight filler material to any voids or gaps. Sand the surface smooth and glass with 0.50 or 0.75 ounce per square yard fiberglass cloth and resin. These illustrations were taken from a similar article published in Model Airplane News magazine. The model can now be disassembled and finish sanded and glassed prior to canopy construction and addition of details. This is an area were it seems everyone has there own favorite method. If you are satisfied with the way you are accomplishing this task, then, by all means stick to what works for you. If you are unfamiliar with this portion of the hobby or wish to try a different method, the following article is an explanation of how to “glass” your airframe. The article was written by Master Modeler – Pat McCurry and was published in the September/October 2001 edition of RC SCALE International magazine. A step-by-step guide to glassing. The key to getting a high quality, fast and lightweight surface of fiberglass onto a model is summed up in one word – preparation. Fiberglass does not cover up or hide imperfections in a balsa wood surface. For this reason it is important to thoroughly fill and sand smooth the entire surface that it to be covered with fiberglass. Once filling is complete, finish sand with 320 grit paper or lighter. Then use a vacuum cleaner or tack rag to remove ALL dust and debris from the surface. This will ensure a good bond of the resin to the surface. Also at this point you need to assemble all the other items you will need for the job so they are at hand when required. These items include rubber gloves, brushes, mixing sticks, plastic spreaders, paper towels and small mixing cups. Begin by cutting a piece of cloth to cover each item that you wish to glass. You need only to cover one side at a time. For instance, if you are covering a wing, begin with the bottom. For a fuselage, try to cut a piece or two that will allow you to cover one entire side. Cut the larger pieces first and work down to the smaller, this will minimize waste. The cloth need only be slightly larger than the piece itself as there will be no significant shrinkage. Make sure all cutting of the cloth is performed before you begin to glass. Find a table or space were you can layout all the pieces of the model with the glass (cloth) that you have just cut laying in position and ready to apply the resin. What we are aiming for is to have each section of the model dust free, with cloth in position on top of it so that all needs to be done is to apply the resin. This will minimize the handling of the cloth. I use Pacer’s “Z-Poxy Finishing Resin” which is a high quality resin with excellent flow characteristics. It requires an equal part of both the hardener and resin for accurate results. Combinations of more or less of one of the parts is unnecessary and thinning is not recommended. As this tend to affect the hardness and curing times. Also, thinning tends to leave resin ‘gummy’ and difficult to sand. If you are in cooler temperatures try to set the individual bottles in a pan of warm water before mixing. This will make the resin less viscous. Typically, epoxy-curing times are affected by temperature and thickness. That is to say it will cure faster in warmer weather and thicker applications. Resin will cure faster in a cup than when spread on to a flat surface such as a wing. For this reason, when mixing resin, only mix an amount that you can work comfortably with for approximately 20 minutes. While the resin will not be cured by this time, this is about as long as the resin in the cup will have the consistency that is best for spreading. For large areas such as a wing, we will mix up only about a third to half a cup of resin. As resin is emptied from the cup, another amount is mixed (in a new cup) and so on. It is far easier to work with in this way. One of the most common mistakes when glassing a model is to mix up too much resin in the beginning (shortening curing time) and trying to work too large an area or too many pieces at once. By extending the working time you will risk having the resin begin to ‘gel’ on the surface, which leads to dragging of the cloth and an overall mess. Plan on mixing several smaller batched of resin throughout the glassing process. By doing so you will stay ahead of the problems that can lead to an undesirable situation. and plan on doing the largest sections first, such as a wing. Depending on the size you are working you may need to mix a second or even third batch to complete the wing. If you complete the wing just before the resin has cured, take a minute to clean the spreader and you gloves with thinners (acetone works very well). In fact, clean up any tools or surfaces that resin may have dropped on in the process before moving on to the next item to be glassed. Take the glassed wing away from the area you are working in and prepare to continue the process as if you are just starting. When working on smaller sections such as separate ailerons of elevators, you can glass several of these in a row before you need to clean up or mix new resin. Just try to keep in mind that it is easier to mix several small batches of resin than one large one and that keeping your hands and tools clean are very important. I cannot over stress these two points enough. First set up an area away from the glassing table where you can leave the glassed items once they are done. This will keep the area you are working in from getting cluttered and keep the parts you just glassed from getting knocked over. As mentioned earlier, it is also a wise decision to have all of the parts to be glassed setting with the cloth already in place and ready for resin. By doing this you will minimize the possibility of handling the cloth with resin soaked gloves which could cause a big mess. You want to be able to pick up a piece from underneath, take it to the glassing area, and pour the resin from the cup directly on the surface with very little handling. It is easier to have to separate tables – one for staging the parts and the other for glassing. - Apply or pour an amount of resin onto the surface (on top of the cloth) in the approximate center of the area you are going to work. It is better to start with too little an amount than to have so much that it begins to run off the edges. - Use the spreader to gently pull the resin out onto the surface as if icing a cake. Work one direction then the opposite (alternate). You will notice that as the resin saturates the cloth, the cloth will become transparent. This is an indication that the cloth is fully ‘wetted’ out. - Continue to carefully work the resin on the surface. What you want to avoid is pulling resin into holes such as servo pockets and gear wheel openings. Also avoid dragging the resin over the leading and trailing edges. You want to work right up to these points, then wipe the excess back resin back. - What we are aiming for here is to saturate the cloth with just enough resin to stick it to the balsa surface and pull rest of the resin away. DO NOT try to achieve a glossy or “coffee table’ appearance. - If you run into a situation where you have too much resin and it is beginning to run on you, don’t be afraid to simply wipe it away with a paper towel, you can always mix a little more. - With a little practice you will find that pouring small amounts of resin, working it out and then adding more is the proper way, rather than to simply dump a pile out and scramble to keep it from running everywhere. - Once you have worked the resin right up to, but not over the edges and various openings you will now need to use the brush to apply the resin. The brush works well to saturate the cloth around leading edges. Simply use it as if painting. For leading edges, I work or ‘paint’ about twelve inches or so at a time and then use a paper napkin to wipe away the excess. - When wiping excess, do it in a chord wise or off-the-edge fashion so a not to displace the cloth. - When it comes to an opening, use the brush to apply just enough resin precisely where you want it – right up to, but not in the opening. Remember, neatness is a key factor to a great glass job. - Continue along with each piece of the model as above and set aside to dry. - When fully cured (at least four hours at 75°F), you can now go back to the sanding block and 100 grit to knock away the excess cloth that is surrounding each piece. It does not take much work and you are not trying to sand the model, you just want to clean up the edges so you can apply cloth to the opposite side. - When finished, you are going to repeat the steps for the other side of the work piece until all of the wood surfaces have a layer of cloth on them. At this point the cloth has a very thin layer of resin over the top of it. So thin, that with just a few hard strokes with an 80 grit sanding block you could easily sand into the cloth. This is what we want to avoid. You will notice that when you run your hands over the surface that you just glassed (when dried) there may be a few spots that need a little smoothing. We want to just knock down these areas slightly with some 220 or maybe even some 320 grit paper. We are not trying to a slick surface yet; we just want to have it smooth enough so that we can apply a ‘flow coat’ of resin. If there are arrears that have runs, you can attend to these with coarse paper, just be sure not to sand through the cloth. Your eyes and hands are the best instruments to tell when enough is enough. If the cloth begins to turn white, you have sanded too far and should stop. Move on and continue to give the model a light sanding in preparation for the flow coat. Basically speaking, the flow coat is the step that seals the cloth and gives you that extra hard surface that we are looking for, whereas the first step is merely to get the cloth adheres to the surface. The flow coat is applied in exactly the same fashion as the first glassing steps using the same tools and methods. The only difference is we are doing it without any cloth this time – which makes it a lot simpler. Here again, we want to stay neat and not apply so much resin that it looks like a glossy coffee table. All you are trying to do is apply enough resin to fill the weave of the cloth and no more. Also, during this process it is a good time top paint the resin into areas such as wheel wells flight surface pockets where you want to seal the wood in preparation for paint but would not be otherwise able to apply a fiberglass cloth. Continue one side at a time as before until the entire model has a full coat to fill the weave. Set everything aside and let dry completely. Now you can final sand the model. It’s best to start with 220 and move on up to at least 320 grit paper. If there are any areas that you have accidentally sanded through, you can easily apply a little resin and sand it out. The model is now sanded and primed. I choose to use automotive catalyzed urethane primer/surfacer. Check with your automotive paint store to see what is currently available. This primer fills fast and it is lightweight and compatible with all finishes. Mix in accordance with manufacturers recommendations and apply with a ‘trim gun’ at the prescribed air pressure. I like to apply a ‘dry coat’ immediately followed by a ‘wet coat’. When dry, block sand with 320 wet and dry paper. Reapply as needed to low areas. When competed and sanded you will be able to see many areas of the base fiber glassed surface. As long as all imperfections are filled and the surface is smooth those exposed areas will not present a problem and, in fact, are an indication that too much primer (weight) has not been applied. Open framed structures are most often covered with a fabric material. Check your plan and scale documentations for those areas. It may be that the entire fuselage and wings will need to be covered, or just items like the ailerons, elevators, and rudder. Some plans call for areas of the model to be sheeted and glassed that on the full size aircraft are fabric covered. You can replicate the fabric covering of these glassed areas by applying thin tape to them to indicate the location of the ribs that would appear beneath the fabric areas of the full size airplane. That treatment will let those areas appear as though they were fabric covered after you have painted the model. There are several types of fabric materials and methods used for covering open areas of you model. Non-scale airplanes are sometimes covered with an iron-on plastic film. We will not be discussing plastic film covering here. There are two basic types of fabric covering – chemically adhered fabrics, and iron-on fabrics. The airframe must be initially prepared before applying either type. Fill all depressions and voids. Sand down the airframe to provide a smooth surface where it will come in contact with the fabric material. Imperfections beneath the fabric, particularly high-spots, will be visible in the finished surface, so spend a little time to make sure everything is level and smooth. Finish sand with 120-150 grit sand paper. When covering a wing you should do the lower surface first, then the top surface. The same would apply for the stabilizer, elevators, and ailerons. When covering a fuselage, start with the bottom, then sides, and finish with the top. This is done so the edges of the material will not be seen from the top of the model. That way, if you are not quite proud of your seam lines yet, no body will know. After all, how many people walk up to a model and try to look at the bottom. I normally cut my fabric about 1”-1 1/2” larger all around, than the size of the item I am covering. That gives you something to hold onto while attaching the fabric to the structure. After you have attached the fabric to the surface you will need to trim the material to suit. You do not want to fold that 1” of fabric over on the other side. You only need about 1/4” material overlap along the seams. Using the wing trailing edge as a for instance - I like to tape a 1/4 square piece of balsa on the opposite wing surface along the trailing edge. Pull the fabric over the trailing edge and trim along the 1/4” square balsa with a hobby knife. That method won’t work for curved surfaces like wing tips but it gives you a general idea of the type of trim you are looking for. Chemically adhered fabrics are those that utilize paints (chemicals) to adhere them to the airframe. The most traditional paint used for this procedure is nitrate dope and the most common fabric used is uncoated polyester material. These materials are best used when trying to achieve the scale effect of a full size aircraft that had a fabric and dope finish. For the sake of brevity, we will discuss only the products of one manufacture. SIG Manufacturing has been supplying our hobby with building materials for longer than memory serves. The combination of SIG Koverall fabric and nitrate dope is the method we will use here. Make sure you use nitrate dope and not butyrate dope for this procedure. Nitrate dope is known as “non-taunting dope”. In other words, it will not shrink when drying like butyrate dope does. That is very important at this point so we do not warp the airframe. After you have made your airframe ready to cover, give it several of coats of nitrate dope. I like to apply three coats, lightly sanding each one a couple of hours after application. Cut the Koverall to size and lay it over the structure. Work out all the wrinkles and adjust it for an even overhang all around. Begin by applying a coat of nitrate dope to the fabric with a ¾” wide or smaller brush. Start at the edge of the structure and work around the perimeter. Pull out the wrinkles as you apply the dope. Don’t worry about the seam lines where the material may have been folded, we will get that out later. The idea is to glue the fabric to the perimeter of the structure with the nitrate dope. The brushing action forces the dope through the fabric and it melts the layers you previously applied to the airframe. The material will be glued to the airframe when the dope dries. Trim the fabric all around the structure and apply another coat of nitrate dope to the perimeter of the structure. This time you will also paint the trimmed fabric to the backside of the structure. When that dries, apply one more coat to the perimeter of the structure. Next step is to apply nitrate dope trough the fabric to the remainder of the structure that comes in contact with the fabric within the perimeter of the structure. Do that two times. Do not apply the dope to the open areas yet. Now we are ready to tighten-up the fabric. For this we use heat to shrink the fabric. You can use a clothes iron set on medium and hold it about 1/2” above the fabric. Do not touch the fabric/doped areas. An easier way to do this is to use a heat gun specifically designed for shrinking model aircraft fabrics and available from a hobby shop or hobby supply house. Do not use a hardware store heat gun. Follow the directions that come with the heat gun. Apply heat to the un-doped areas. Do not apply heat directly to the perimeter of the structure. The fabric will become drum tight. After you have completed covering you model it is time to paint the entire covered surface with at least two light coats of nitrate dope. Do not apply heavy coats as the dope will flow through the fabric and collect on the opposite side. You will have a real mess if that opposite side is also fabric covered. The airframe is now covered and sealed and ready for paint. You can use practically any finish over nitrate dope but I would stay with SIG recommended products at this point. I would recommend butyrate dope with a clear topcoat for a nice high-gloss dope finish. Okay, now let’s do it the easy way. Iron-on fabrics have one side coated with a heat-activated adhesive. You basically place it, coated surface down, on the structure and iron it in place. There are several manufacturers of iron-on fabric for models. They each have different characteristics. Some will shrink more in one direction than others. Some have adhesive that will come through the fabric if too much heat is applied. Some fabrics come pre-painted so you don’t need to paint the model. I would recommend you put a clear topcoat on the pre-painted fabrics for additional fuel proofing. It also helps to make the model easier to clean up after a day at the field. I particularly like to use Solartex available from Balsa USA for smaller models and items such as ailerons, and elevators on glassed models. Solartex is a very fine weave fabric and shrinks evenly in both directions. Once shrunk to fit it does not loosen up like some fabrics do. One drawback I have found with Solartex is that dopes tend to react to the color treatment applied to the outer surface. Another is that it only comes in 27” wide rolls and that may not be big enough for some large model wings. I recommend Super Coverite for larger models. It is available from Tower Hobbies and comes in rolls 38” wide. You will need a hobby sealing iron and heat gun when using iron-on fabrics. They are available from a hobby shop or hobby supply house. Cut the fabric to suit the structure to be covered. Iron the fabric to the perimeter of the structure. Trim it and iron the edges down all around. Now use the heat gun, from the center of the structure to the edges, to shrink it to suit. Do not apply excessive heat to the perimeter or you will shrink the fabric away from the edge. Next iron the fabric to the remaining structure beneath it. You are now ready to prime and paint. Follow the manufacturer’s directions supplied with the product with regard to heat and application of their materials and I am sure you will be pleased with the finished results. PART 14 - SURFACE DETAILING. This work is done after the model has been primed and sanded to a 320-grit paper finish. Refer to your documentation and decide how much of the surface detail you want to replicate on your model. Most notable will be the primary panel lines, hatch and inspection plate openings and covers, raised rivet, flush rivets, fasteners, hinges, etc. Each one of these details can be replicated on the model surface by numerous methods. We will explain how to accomplish each of these details by using only one of the many available techniques simply as a method for the less experienced to get started with. Panel lines are often a very subtle surface feature on full size airplanes and will show up to an even lesser degree on a model. An exception is those aircraft with overlapping panels like the Hellcat and SBD. Each of these types of panel lines is easily replicated. First, layout the panel lines on your model with a #2 pencil. Do not press down hard, light lines will show up just fine and can be more easily erased should you need to do so. For flush panel lines, lay down 1/16” wide “Chartpak Picket” graphics tape over the lines. Chartpak tape is available from most drafting supply and arts and graphics stores. You can also find it at Office Depot. Use a sharp X-Acto knife to cut them to length on the model. Next, mix up some of the same primer used on the model already. Using a ‘trim gun’ spray several passes over just the trim tape. Spray a pattern about 2” wide centered on the panel lines. Repeat this several times allowing the primer to flash-off between coats. After the primer has dried, the panel lines can be sanded and feathered into the surrounding primer. Use with 320 wet and dry paper. If you are able to sand your model ‘wet’ without getting water into the interior or uncovered areas on the model you should do so. First sand directly over the tape until it is just exposed thru the primer. Then sand the recently applied primer on each side of the panel line to feather it into the existing primed portion of the model. Once you have completed this all over the model you can remove the Chart-Pak tape. Use an X-Acto knife to peel up one end of the tape then, with your fingers, gently peel if back and off. Some reside may be left behind but can be removed with a paper towel moistened with denatured alcohol. Test this on you primer first as you do not want to use something that will dissolve the primer. Replicating overlapping panels is done similarly but with different tape. Apply 3/4” or 1” wide ‘low tack’ painters masking tape so one edge represents the panel line. The tape needs to be placed on what will be the lower panel, or that one that fits under the panel adjacent to it. Primer the surface like above. Sand and feather, then remove the tape. Presto, instant overlapping panel lines. You may wish to apply two or more layers of tape to indicate a thick panel. Hatches and inspection plates can easily be replicated using metal duct tape available from hardware stores. Cut the panel to size and stick in place. Press in place using a squeegee fashioned from 1/8” balsa. This stuff can even be used to trim a canopy to replicate the framework. Cut the tape into strips the widths desired and apply to the canopy. Mask the canopy and paint. Raised rivet can be replicated using the ‘glue drop’ method. There are many ways to this. Most often, the rivets are applied to the finished painted model as they dry clear anyway. A disadvantage of this is that the rivets are easily knocked off and they have no protection from the elements. I like to install then ‘under the paint’ on the primed surface. Painting over them with enamel or heavy paints will enlarge them so compensate to suit your final finish. Mix some “white glue” and water to achieve a consistency of cream. Place the mixture in a shallow container like a small saucer. Use a toothpick and dip it into the solution then touch it to the model. Experiment with the consistency of the mixture and the sharpness of the point on the end of the toothpick until you are able to get the correct size rivet. Notice the rivets shrink considerably after dried. You will become proficient at applying the rivets quickly. Several rivets usually can be placed with one dipping of the toothpick into the solution. Flush rivets can be replicated on the model surface using a piece of brass tubing in a soldering iron. This rivet should be applied to the finish painted model as they will fill with paint and disappear if put down on the primed surface. Select a piece of brass tubing that closely matches the diameter of the rivet. Sharpen the one end of the tubing to produce a sharp edge on the outside diameter. Fit the tubing into a pencil type soldering iron. Mark the locations of the rivets on the model. Heat up the soldering iron and press the sharpened brass tubing squarely into the model at the appropriate location. A screw head can be replicated using the above method then come back with an X-Acto knife with the tip broken off and sharpened to replicate the screwdriver point. Heat up the X-acto blade and press it into the center of the flush rivet to create a screwdriver point. Non-functional piano hinges can be replicates using plastic rod or tubing. Plasti-Strut markets small plastic shapes for use in architectural model making. They are available at most hobby shop. Choose a plastic rod or tube that matches the hinge diameter. Mark on a piece of paper the length of the piano hinge segments for the hinge you a going to replicate. Place the plastic piece on the paper over the marks. Place an X-Acto knife on the piece at the hinge segment location. Roll the piece with the blade marking the segment around the piece diameter. Cut to length and glue to the model. As stated early on, there are many ways to develop this kind of scale detail and the methods described here are but one way. If you are unfamiliar with ways of producing these details give these methods a try. The longer you use them the more variances you will make until you are doing it “your way”. This is an area that can bring your model to life if done well. We will only be discussing fixed canopies, windshields, and side windows for high-wing cabin aircraft. You can install these items after the model has been painted in most instances. I have included some drawings by Jim Newman that were published in the now defunct R/C Scale Models magazine at the end of this article for those wishing to have a try at sliding canopies. The windshield and side windows are normally cut from a sheet of clear plastic and installed in place on the model. Some plans do not have a pattern of the windshield you will need and some do. In either case you should make a windshield pattern from cardboard first. I like to use the cardboard from the back of a writing paper tablet. Leave about 1/4” of material at the top and sides to attach it to the airframe. You may need to crimp the top and side edges to get a good tight fit. Trim the pattern until you have achieved a good fit and then trace the outline on the plastic with a fine-line felt tip pen and cut the plastic windshield to match. You should use an adhesive specially formulated for gluing clear plastics to you model. These adhesives dry clear, will fill voids, and are flexible when dry. The two most popular are J&Z R/C 56 Glue and Pacer Canopy Glue. Both are available from Tower Hobbies. Apply a bead of the glue to the top and side edges of the plastic windshield to hold it in place. I like to put shortened straight pins along the side and top edges thru the plastic into the airframe at about 1/2” on centers to stake the windshield in place. Apply a bead of canopy glue to the junction of the windshield and the fuselage. You can trim these attachment areas by using a trim tape that matches the color of the model. The side windows can be installed on the outside of the model or from the inside if the plans designer has made provisions to do so. Vacuum formed canopies normally require trimming to fit the model. Carefully trim the perimeter of the canopy a little at a time until it seats firmly on the model all around. Use the same canopy glue noted above for the installation. The canopy framework must be applied to the canopy. Some canopies are provided with raised framework and some have no framework. You can apply the framework with different width trim tapes that match the color of the model. You also can mask off the canopy and paint the framework on. Carefully layout the canopy framework with trim tape. Mask the remainder of the canopy. Remove the trim tape. Make sure the masking tape is pressed firmly in place. The best masking tape to use is the blue colored, low-tack stuff sold in automotive paint supply stores. Do not use drafting tape and inexpensive hardware/drug store masking tapes as you may not be able to get them off without damaging the canopy. Of course, you will need to mask the remainder of your model before spraying the canopy framework. Clean the areas to be pained with a rag dampened in denatured alcohol. After the areas are dry, spray several light coats of paint on the canopy framing. Have no fear if you have scratched you canopy or would like to use an old one that has lost its luster. If it is a small scratch you can try to polish it out using toothpaste and a wet cloth. Most of us are not that lucky though. Here is a tip for the more severe cases. Sand out the deep scratches with 120 grit wet and dry paper. Do all sanding wet. Wet the paper in a container of water ever so often while you are using it. Next sand the entire outside surface of the canopy with 320 grit wet and dry paper. Follow this with 400 grit and 600 grit. Wash the canopy in warm soapy water and rinse to remove all soap. Next we are going to clear coat the canopy. Make sure you are in a dust-free environment. Use a high gloss clear, non-yellowing, two-part epoxy or two-part urethane paint. Thin it and spray apply it. Start with a light tack coat and allow 10 to 15 minutes to start setting up then apply one wet coat. There are many different kinds of paints and primers available. We will touch on some of the major ones used for our types of models. I suggest you use all the necessary products from the manufacturer of the type of paint you select for your model. Most often they can furnish compatible base coats, finish coats, and thinners. Do not attempt to mix and match products from various manufacturers unless you have had successful experience in doing so. In general, all finish painting should be accomplished by spray application of the paint. One exception is dope finish. Unless you are experienced in spray application of dope it is recommended that you use a brush. There are various means of spray application of paints from the use of aerosol paint cans, to small compressors with storage tanks and a spray gun. Painting with aerosol cans may be the method you choose if you don’t have, and do not want to by a compressor. You should be fore warned that it will take more spray cans to complete the job than you think. Spray several light coats on the model allowing them to dry between coats. The last application of paint should be a light coat followed by a “wet coat” to bring out the gloss. When choosing between an airbrush and compressor, and a larger compressor and spray gun, I would recommend the larger compressor and spray gun. Two primary reasons for this are the economical impact, and the large range of use for the compressor and gun combination. A good air brush/compressor set up will often cost more than a compressor and spray gun. The airbrush has limited use when it comes to painting large areas like wings, etc. I suggest a tank-mounted compressor with at least a 2-horse power motor and a minimum of a 6-gallon air storage vessel. Look for an air delivery rate exceeding 3 cubic feet a minute at 40 pounds per square foot gauge pressure. Discount tool stores such as Harbor Freight have compressors like these for under $100.00. You can also find a cup gun and hose there for under $20.00. The primers we are referencing here are those used to give the model a smooth surface and prepare your model for finish painting. As stated earlier, I prefer to use automotive acrylic lacquer primer because it has excellent fill and coverage and sands easily. Many of the hobby paint manufactures also have a line of primers specifically for their finish paints. If you have chosen a light finish color for you model you might want to apply a base coat of light colored primer to provide a surface that will be give the light colored finish coat an even overall color on the model. When selecting finish paint for your model I suggest you use paint manufactured by one of the companies that supply the products specifically for our hobby. These paints have finer pigments than commercially available paints. They offer better coverage and lower weight. Do not use hardware store paints. Until recently the trend has been to use water based latex house paint for models. Now there are several water based hobby paints available. One of the preferred manufacturers for colors of military aircraft is WarbirdColors. This paint is a two-part, water reducible, polyurethane. The paints are supplied to the correct color matches for military aircraft of nine nations. They are thinned with water and water is used for clean up. NELSON Hobby Paint from NELSON Hobby Direct is a supplier of similar paint. The NELSON paint is available in a wide range of colors for both civil and military aircraft. Cheveron Perfect Paints has a great line of polyurethane paints. There is a wide color range available for both civil and military aircraft. K&B Manufacturing UltraPoxy paint system and Klass Kote paints make a full line of epoxy paints and primers. These are two-part, air dyed epoxy paints. They are available in a standard range of colors and can be mixed to provide colors for military models. SIG Manufacturing Plastinamel is specially formulated enamel that will provide a light, high-gloss finish. It comes in eight colors and can be mixed to produce shades as required. SIG Manufacturing has a large line of nitrate and butyrate dope products designed for the modeler. The preferred “SIG System” is the use of their dopes and SIG Koverall fabric. Randolph Aircraft Products is the largest and oldest supplier of dopes for full size aircraft. Randolph dope products are ideal for modeling use. The preferred system is the use of Randolph dope products and Ceconite Uncertified Light fabric covering. Ceconite fabric and Randolph dope is available from Aircraft Spruce and Supply. Contact them for a free catalogue. An auto paint store can mix your finish colors to match the Federal Standard (FS) numbers of the colors used on the full size airplane. Base coat/clear coat urethane paints with a flat clear top coat is a popular option and is fuel proof. Don’t be alarmed after applying the base coat. It may look ‘blotchy’ and the wrong shade but all will be well when the clear coat is applied. Various levels of clear topcoat are available from a high gloss ‘wet look’ to dead flat. Be sure to tell the paint store what you are trying to achieve. FRP = Fiberglass reinforced plastic. Sometimes known as GRP (glass reinforced plastic). * Do not repair epoxy fuselages, parts, etc. with polyester resin based products, as they will not cure over an epoxy base. You can use epoxy to repair polyester based products though. 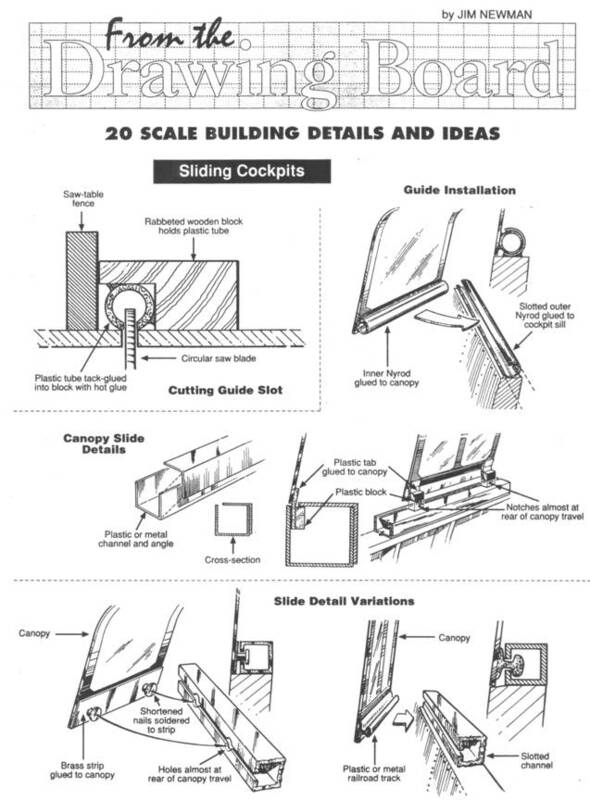 PART 18 – BUILDING TIPS FROM THE DRAWING BOARD of Jim Newman.